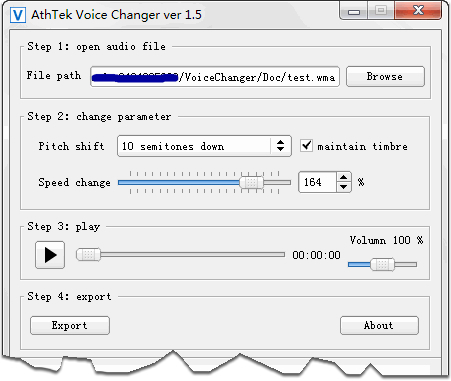 Description: Free voice changer for Windows. It can flexibly change the voice pitch of an existing audio file from -1 to +1 octave. It can also change the playing speed of the audio file to be fast or slow. It supports to import many types of audio file such as *.wav, *.wma and *.mp3. It also supports to export audio files with funny sound effects to *.wav files. With a recording of your voice, it can change your voice to be male or female effortlessly. 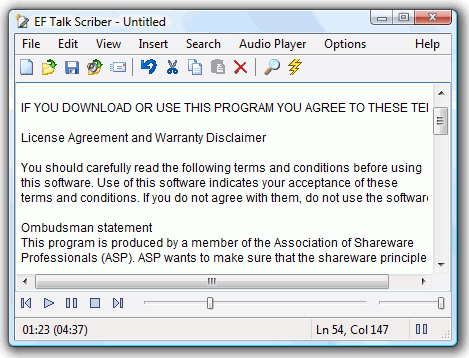 Description: Audiobook Recorder is easy to use text to audiobook (MP3) converting software. Also it can read any text using different human voices. The unique 'Smart Pause' feature can detect situation when pause is required, but no punctuation mark exists between words (e.g. in Contents). Adjustable speed and volume improve text recognition. It opens MS Word (doc), HTML and text (RTF) files as well as converts them to WAV and MP3 files. Free trial download. Description: Enterprise-ready speech recognition software, Dragon Naturally Speaking Professional lets you interact with your PC by voice - three times faster than typing - to boost productivity and cut costs. Control your PC with simple voice commands. Create documents, send email, and search the Web just by talking. Create macros to automate business processes. Even use a digital voice recorder and Dragon will transcribe the audio files back at your PC. Description: Naturally Speaking Standard is the fast, fun, and easy way to interact with your PC by voice. Say works and they appear on the screen - three times faster than typing. Tell your PC what to do and it does it. For everything you do on your computer at home or school, there's no simpler way to get more done faster. Use your voice to dictate and edit in any Windows application with Naturally Speaking Standard, or even surf the web just by speaking! Description: Go SpeedUpMyPC automatically fine-tunes all your resources including hardware, system settings and internet usage to operate at peak performance at all times. Your PC will instantly become faster, cleaner and more stable . Description: Converts any text into spoken words. Reads Text, Email, Web Pages, and Documents using your choice of voices. Unique Text to MP3 or WMA conversion saves your daily reading to audio files for download to your portable player. Listen to email, online news, or important documents while you exercise, work or commute. Available with exciting premium voices from ATT Natural Voices, Cepstral, NeoSpeech, Acapela, and Nuance/ScanSoft RealSpeak. Description: Go Voice Changer Software Diamond 4.0 is both a voice changing program and a home recording studio. In addition to basic functions, Voice Changer Software Diamond provides all the usability and audio manipulation tools you'll need, including Nickvoice Rules , Limiter , Noise Reduction , and many more. Description: With Dragon NaturallySpeaking you could create email, documents and spreadsheets simply by speaking. This revolutionary and easy-to-use product gives you everything you need to be more efficient with your computer. Turn your voice into text three times faster than most people type with up to 99% accuracy. It's so easy, you can use it right out of the box. It learns to recognize your voice instantly and continually improves the more you use it. Description: Pb Vocoder is a software application that can make a human voice sound like a singing synthesizer, a robot, a demon, and everything in between. All in a simple to use, lightweight package! Renders to disk, or directly to your soundcard. You load the Wave files that you want to use directly into the application, no third party Direct X or Vst host is required. Supports sample rates between 8000 and 192000 hZ, in 8 or 16 bit format.